What was I seeing? Inflated fruits. A specialized orange aphid. Paul Snyder of Secrest Arboretum showed me a picture of this plant the previous week. Now, I followed Paul's instructions and was outside the Entomology Annex at OSU's Ohio Agricultural Research and Development Center in Wooster. Once in the genus Asclepias like other milkweeds, this increasingly popular ornamental plant now has the Latin name of Gomphocarpos physocarpus. What’s in a name? Carpos or carpus means “fruit”. 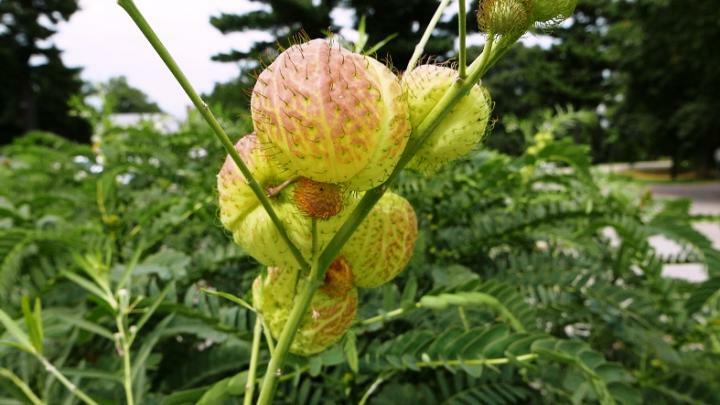 The physo-carpus part of the name literally means “inflated fruits” which is obvious from its bladder-like fruits and another of its common names of balloon-plant. The genus name of Gompho-carpos is a little less obvious to me as it means “nail-fruit”, though perhaps it is the spike-like projections on the fruit’s surface. By any name, it is oddly spectacular.The flowers, as with all milkweeds, are also quite unusual and complex. Petals are reflexed backward. The male pollen is fused into pollinia like orchids rather than individual pollen grains. Pollinating bee mouthparts are inserted into pollinia in a complex mechanical procedure. After fertilization of sperm and egg, the seeds develop in overlapping rows attached to silky floss-like hairs known as the coma, known to all boys and girls who check out milkweeds. And on and on. Milkweeds are in the Apocynaceae family and as I collected a sample of this plant this week for a workshop, I noticed that it was home to thousands of oleander aphids. Guess what? Oleander aphids only feed on plants in the Apocynaceae family: milkweed, oleander, and vinca being common hosts. And, monarch butterfly caterpillars also feed on Gomphocarpus physocarpus, like other self-respecting milkweeds. Natural connections galore.